Looking to explore a bit more of Toronto? Scarborough is a neighborhood in Toronto, Canada bounded by Lake Ontario, Victoria Park Avenue, Steeles Avenue East and the City of Pickering. While Scarborough may not get nearly as much attention as other Toronto neighborhoods, it definitely shouldn’t be overlooked. Whether you’re visiting Toronto and curious about the area, or a local who hasn’t spent much time there, here are some of the best things to do in Scarborough. One of the best things to do in Scarborough is spending some time at Canada’s premier zoo and one of the largest zoos in the world. Here you’ll find over 5,000 animals representing over 450 species. Animals are divided into seven zoogeographic regions: Indo-Malaya, Africa, the Americas, Australasia, Eurasia, Canadian Domain and the Tundra Trek, featuring a five-acre polar bear habitat and underwater viewing area. There are also over 10 kilometers (six miles) of walking trails at the zoo to explore as you check out the animals. In the summer months for kids and families, there’s also the option of cooling off at Splash Island, a two-acre splash pad, perfect for relief on hot days. To learn more about the animals at the zoo, there are daily animal keeper talks and feedings where you can see the animals up-close and find out some interesting animal facts. The Toronto Zoo is open year-round. Go back in time to the very beginning a of Scarborough with a visit the Scarborough Museum. Set along the walking trails of beautiful Thomson Memorial Park, the museum showcases the history and development of Scarborough from its founding and early settlement, all the way to its growth and eventual transformation into a major suburb of Toronto in the 20th century. The site of the museum and its beautiful gardens (worth a look in their own right) are situated on the property of David and Mary Thomson, who first settled in Scarborough in the late 1790s. Scarborough is home to a swath of nature that makes for an ideal escape from the city — without having to actually leave the city. Rouge National Urban Park is open year-round, accessible by public transit, and the largest urban park in North America. Once you’re here, there’s a wide variety of things to see and do, depending on your interests. There’s a beach here (mentioned below), as well as numerous hiking trails suited to hikers of every level. If you like birds, Rouge National Urban Park is a great place to go bird watching thanks to the 225 bird species that have been observed in the area. The mouth of the Rouge River and the surrounding marsh area are also popular fishing spots if you want to try and get a bite or two. And for anyone who likes camping, this is the only place to pitch a tent and sleep under the stars right in the city. There are a couple of beaches to check out in Scarborough when the weather is warm enough. Bluffers Beach, located at the southern end of Brimley Road, is known as one of the most beautiful beaches in Toronto and named for the Scarborough Bluffs that tower over it. There are walking trails to explore here, as well as an outdoor shower and picnic areas if you want to pack a lunch. Or, head to Rouge Park Beach in Rouge National Urban Park, where you can swim in Lake Ontario from the wide, sandy shore. There is a lifeguard on duty when the beach is officially open, and there are washrooms available during the summer months. If you want to get a little more active, you can also canoe, kayak, or paddleboard around the Rouge Marsh, the largest and best remaining wetland in the City of Toronto. If you’re looking for another water-based activity in Scarborough for the whole family in addition to hitting the beaches in the area, it’s worth paying a visit to Kidstown Water Park. This is the only water park operated by the City of Toronto and offers a fun range of water features, including a tipping bucket, spray rings, squirting aquatic animals, a slide, wading pool, splash pad and more. There are also picnic areas here for anyone wanting to make a while afternoon of a visit. Kidstown opens from mid June until the Sunday of Labour day weekend. The majestic Scarborough Bluffs are one of the most scenic sites in Toronto. 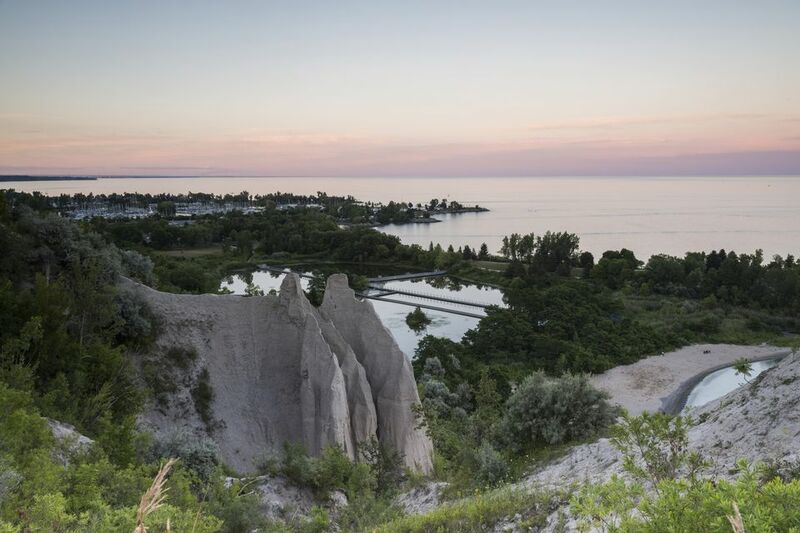 Stretching for about 15 kilometres along the Lake Ontario shore, the Bluffs are a significant geological feature caused by the accumulation of sedimentary deposits over 12,000 years ago and formed by wind and water erosion from Lake Ontario. You can see the bluffs from one of eleven parks along that 15 kilometre stretch of Lake Ontario. Built for the 2015 Toronto Pan Am and Parapan Am Games, Toronto Pan Am Sports Centre (TPASC) is an excellent facility co-owned by the City of Toronto and the University of Toronto. You can use the aquatic facilities during drop-in leisure swim times at no cost, but the range of other facilities, including a climbing wall, fitness centre, running track, and various drop-in classes can only be accessed with a membership to the TPASC (ideal for locals and frequent visitors to the area). This park, part of the Scarborough Bluffs, is one of Toronto's largest parkland areas along the city's east waterfront. If you’re a fan of birdwatching, this is a great park to visit because it’s a migratory staging area for over 178 species of birds as well as for monarch butterflies. In addition, there are walking and biking trails here to explore. Toronto's Distillery District. Don't expect the same old franchises.